Do you want to display testimonials on your WordPress website? Testimonials are the positive experiences of your products/services shared by service consumers. They can be effective in building trust with your new clients and can persuade them to make the purchase. Moreover, adding these positive recommendations from your satisfied customers can play a vital role in boosting the credibility of your business and improving the conversion rate of your visitors. How to Add Testimonials on WordPress website? Testimonials, being one of the essential element for any website comes inbuilt sections on most of the WordPress templates. However, they may lack the functionality to display the testimonials in different pages/posts of your site. Moreover, they may also contain very limited options to display good looking testimonials. Therefore, in order to add the testimonials on different pages/posts of your WordPress website and create attractive testimonials, we recommend you to use the WordPress testimonial plugins. As they come with different features and customization options to add beautiful testimonials in no time. 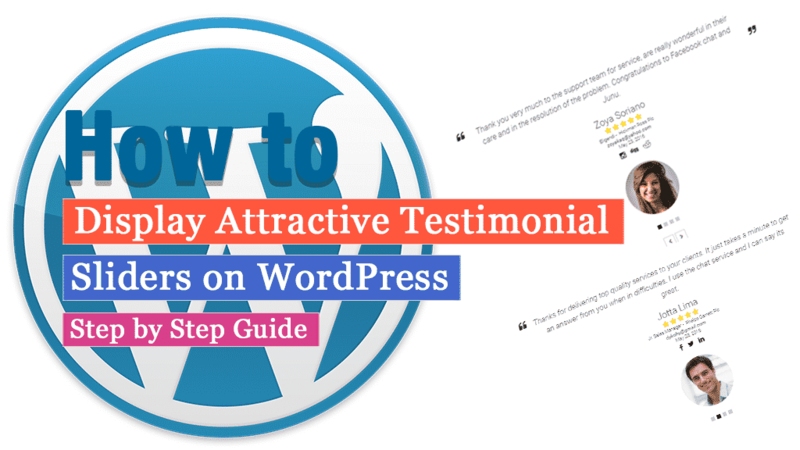 Here, in this article, we will be using AP Custom Testimonial Pro plugin to show you how to add attractive testimonials on your WordPress website. It is one of the highly rated and best-selling WordPress plugins that will allow you to create and add testimonials on your WordPress website without even any coding skills. 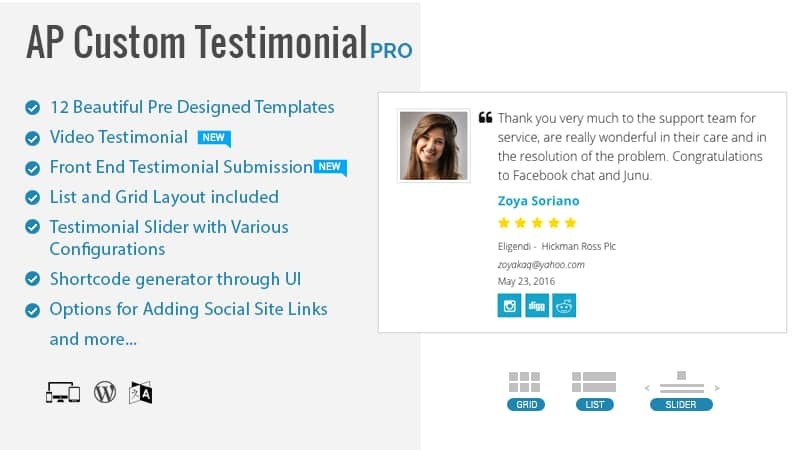 Purchase AP Custom Testimonial Pro plugin from CodeCanyon marketplace at the price of $19. Then, install it on your website and then activate it. If you have any difficulty while installing the plugin, you can take the help of its documentation. After you have successfully installed the plugin, you will see “AP Custom Testimonial PRO” on the left menu of your WordPress dashboard. Click on it to start adding the testimonial slider on your WordPress website. You will land on the Testimonial Manager page. It consists of all the testimonials that you have on your WordPress website. To add a new testimonial click on Add Testimonial. You will land on create testimonial page. Enter the author name, company name, his position, company URL, and email address. Also, choose the rating of the author, then add his feature image or video, set the publish date and then write his/her description. After you are done click on Add New Testimonial. Then you will be redirected to testimonial manager page. From here, you can adjust the settings to control your testimonials as per your requirement. The page consists of image setting, color setting, background setting, and typography settings. Adjust all the settings as per your preference and then click save settings. 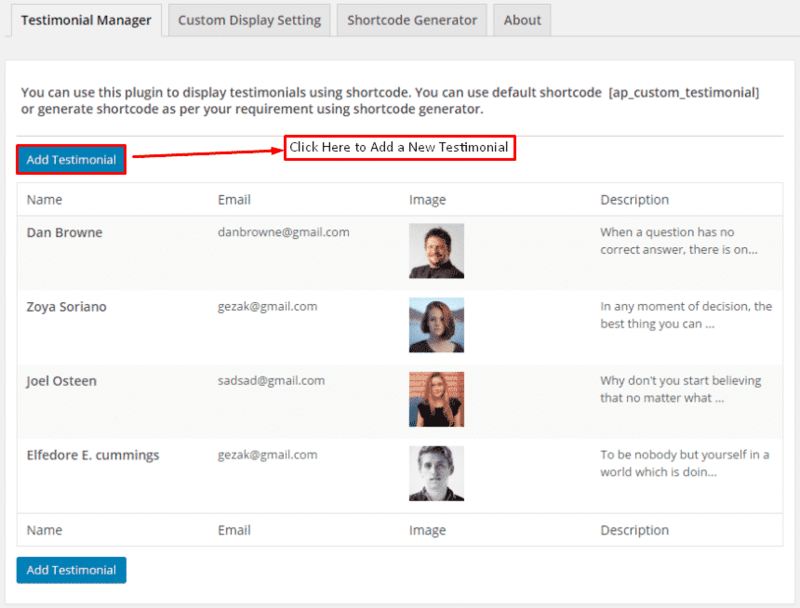 General Settings: Select the layout and template of your testimonials. You can choose any of the 2 layouts i.e. slider or list and 10 templates. Here, we have selected the slider layouts. Google Place Review: Set the number of Google review you want to show. Miscellaneous: Set the content length and number of testimonials you want to display. Show/Hide Contents: Enable/Disable Title, Company Detail, Author Email, Publication Date, Featured Images, Ratings, and Social Media Links. Order of Testimonial: Set the order of the testimonials you want to display. Also, select the order type. After you are done editing click on Generate Shortcode. A unique shortcode will be generated. 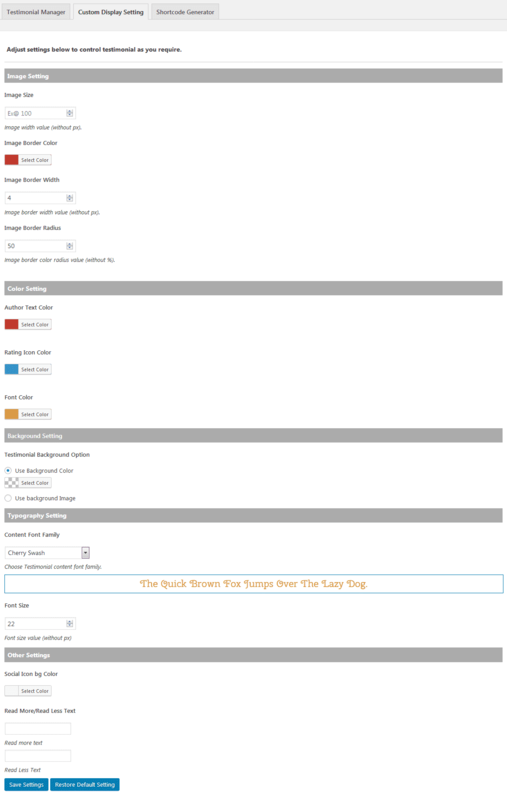 Copy it and paste it on any posts, pages or widgets of your WordPress website. From here you can add the testimonial submission form on your WordPress website. 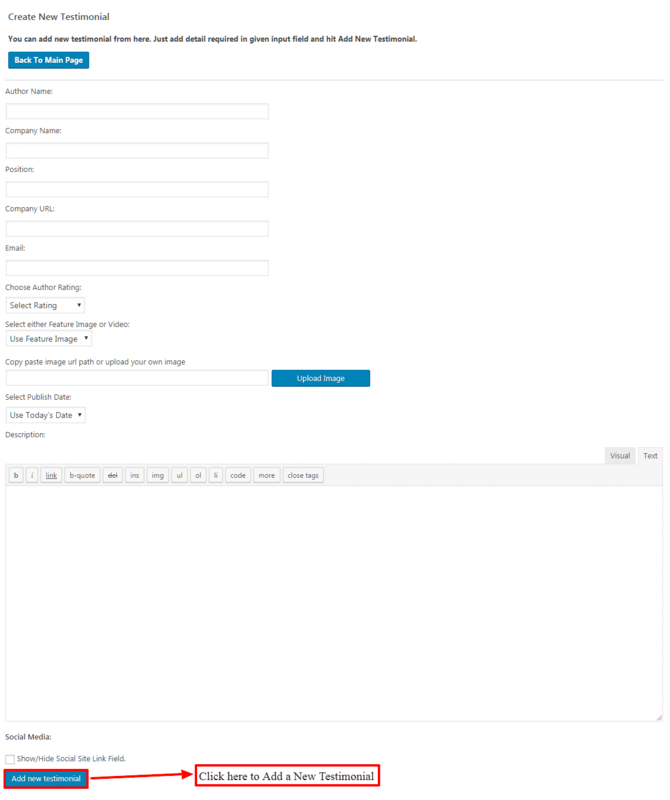 Configure all the options available on the Testimonial Form Settings then copy the given shortcode on Submitted Testimonial page and paste it anywhere on your site where you want to display the submission form. Using this plugin, you can also display the Google Place Review on your site. 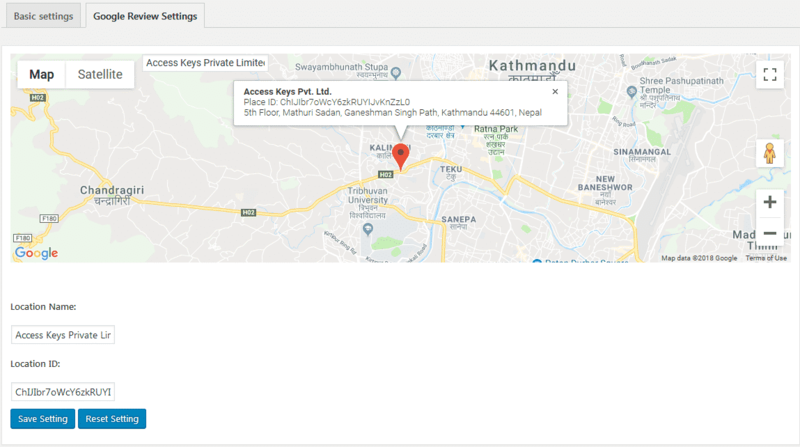 Configure all the options and then copy the given shortcode and paste it on any page, post, custom post type or widget of your WordPress website. In this way, you can add testimonial slider on your WordPress website in a few minutes. Testimonials are one of the most important elements of a WordPress website that directly affects the credibility and conversion rate of your WordPress website. Therefore, if you want to display them attractive then, you can purchase the above-mentioned plugin and follow this step by step tutorial. Previous articleHow to deactivate a WordPress plugin? 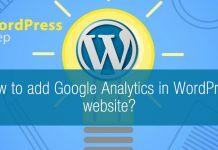 How to add Google Analytics in WordPress website? Hey Buddy!, I found this information for you: "How to display attractive testimonial sliders on WordPress website? (Step by Step Guide)". Here is the website link: https://wpallclub.com/display-attractive-testimonial-sliders-on-wordpress/. Thank you.